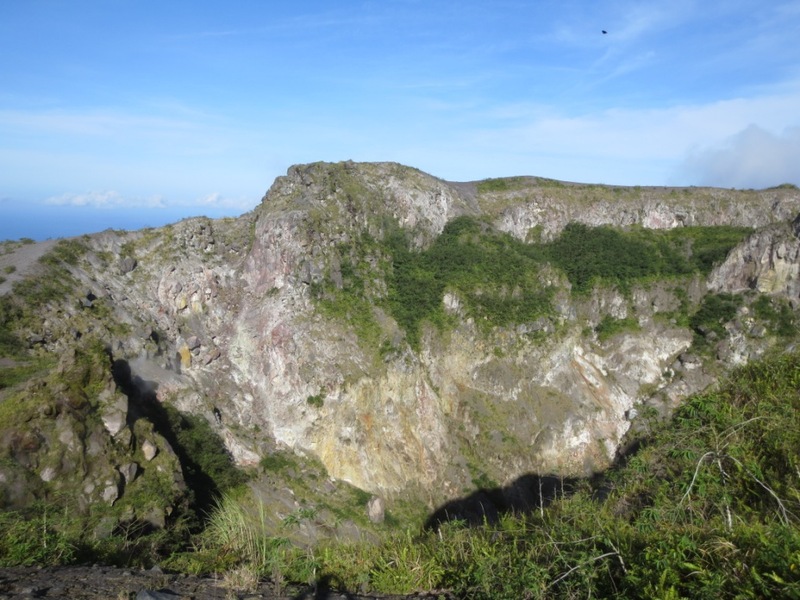 Gunung Ruang is the southern-most volcano in the Sangihe arc between North Sulawesi and Mindanao in the Philippines. 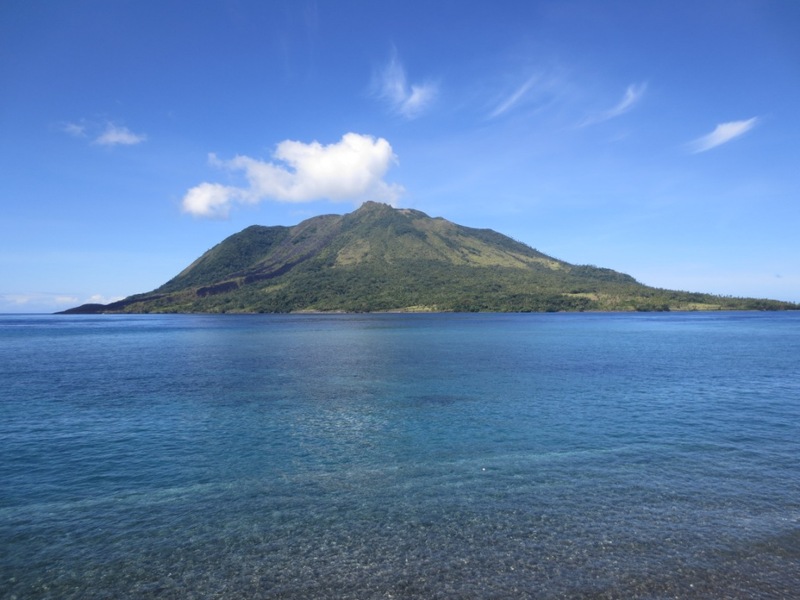 The island volcano is situated in Kebupaten Sitaro next to the island of Tagulandang. The last significant eruption was in 2002 when two kampungs had to be evacuated. Since then, Ruang continues to be active with fumes around the crater. For some reason, many locals call the island and volcano ‘Duang’. 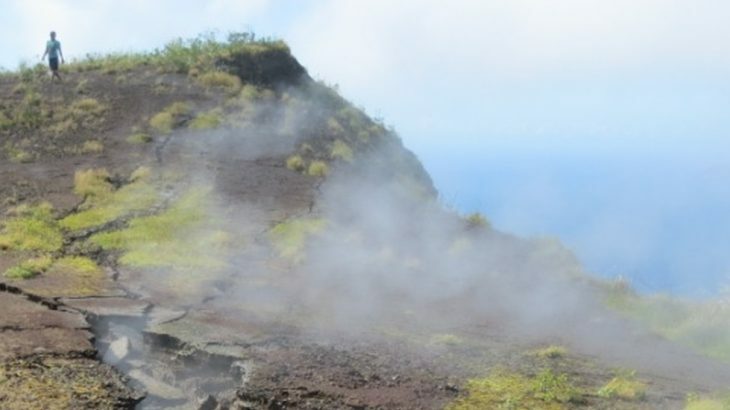 The usual route up the volcano starts at Desa Laingpatehi at sea level through plantations. Note that as Ruang is infrequently-climbed the condition of the trail depends entirely on when the last hike to the top was and could mean the difference between 90 minutes (if the trail is clear) and three hours (if nobody has hiked to the crater for many months and is densely overgrown). Either way, it is a good idea to start the hike as early as possible and take a lot of water with you. Not long after starting you will reach a hut surrounded with old coconut shells (210m). This is a mini-factory for the production of coconut oil which is then transported and sold on mainland Sulawesi. This hut is worth remembering on the way down as a good place to stop off for a coconut juice if you have guides who are able to climb the palms (most locals will be able to) and hurl a few down. At mid way, there is a section that is quite steep with a lot of gravel, which gives the feeling of “unpassable” and in places it is easy to lose the trail entirely. However, the views soon open out to nearby Tagulandang island with its two main summits of Bukiri Kalongan and Gunung Malingge, and northwards to Siau’s Karangetang volcano. 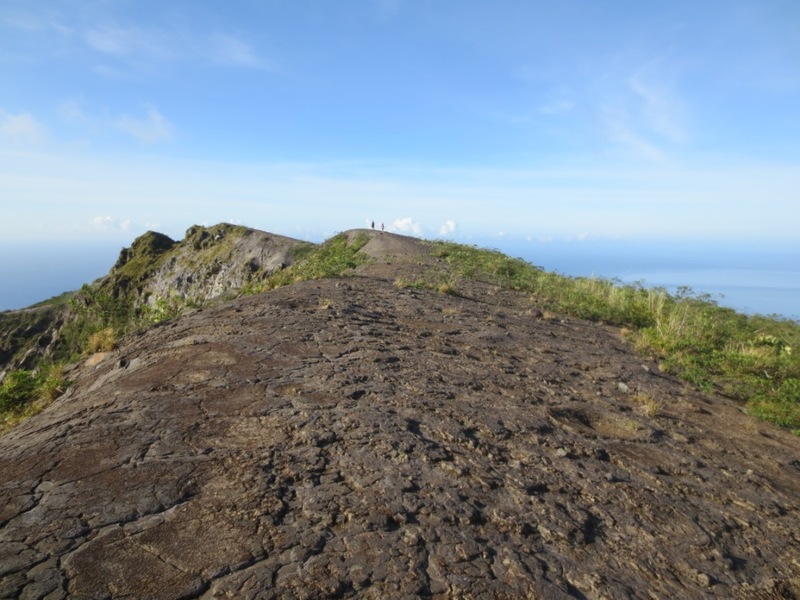 Soon you will have reached the volcano’s outer rim where you take a right to reach a grassy peak with a cement square with ‘Ruang’ written on it (700m above sea level). Beyond this minor bump, the ground is covered with old lava flow and scrubby bush and there is a great deal of birdlife. Indeed, Maleo birds may be seen. The whole summit area is complex with deep ravines full of vegetation and wildlife. 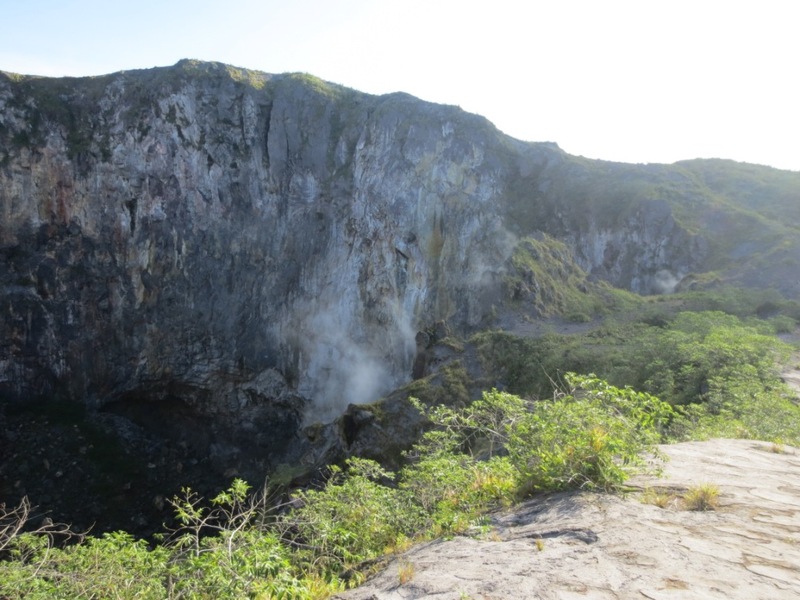 The main, active crater is around 500 meters in diameter with a depth of 50-100 meters. There is a path around most of this main crater (also 700m above sea level) passing through sulphur vents with hot soil under foot. 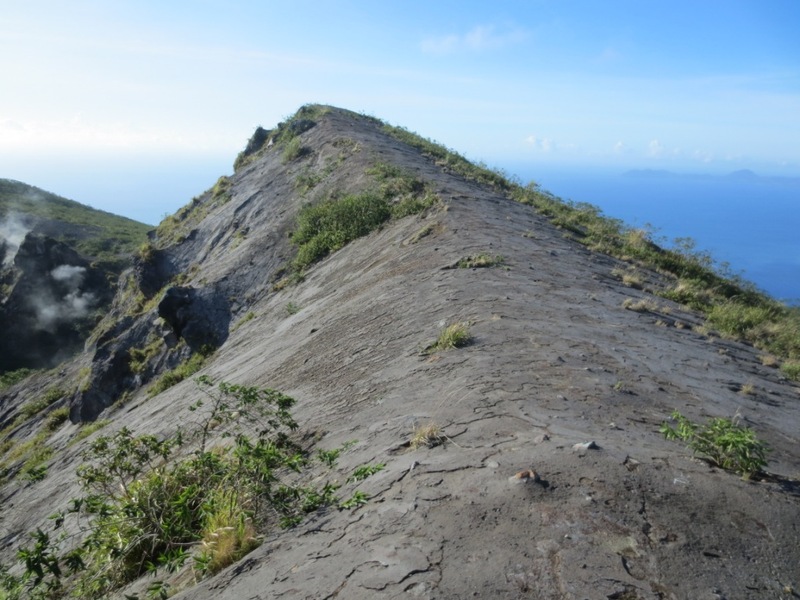 The true summit is on the far side of the main crater and is a jagged series of cliffs beyond overgrown and challenging terrain. It remains unclear whether anyone has climbed to the true summit and indeed whether it would be better to attempt to reach it from a clockwise or anti-clockwise direction, but a fair bit of time and a machete or two would be most useful! Return to the village of Laingpatehi in about 90 minutes or 2 hours. Getting there: To reach Gunung Ruang from Manado, take a speed boat at Manado port to Tagulandang. These boats go in each direction daily. The journey takes about two hours and thirty minutes and the current cost is Rp 175,000 (2017). There is also a slower night boat several times a week costing Rp100,000. Ruang is nearby Tagulandang. Desa Laengpalehi is reached from Tagulandang by hiring a local fisherman’s boat and takes about half an hour. Cost of the boat is around Rp 100,000 one-way or Rp150-200,000 return (specify a time to be picked up). There are occasional public boats for much less but these are not always at ideal or set times. A guide should be found on Ruang island itself and usually costs around Rp 150-200,000. Accommodation: You are likely to be able to stay at a basic village house but there are three hotels on nearby Tagulandang. Permits: Register with the village head. Water sources: Assume none available. Featured, Sulawesi Utara Spesial. permalink. Climbed Ruang last week with help from someone I met at Chill Out Cafe in neighbouring Tagulandang. You might say I climbed it one and a half times as sadly the trail was totally overgrown (probably due to lack of use for many months) so after reaching an elevation of 230m had to go back down and get some village boys to come up with us. 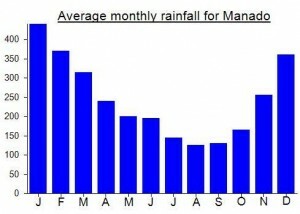 A shame there isn’t a bit more initiative shown by local authorities – it wouldn’t cost much to pay a local villager a small monthly fee to maintain a trail – as surely there is potential for more tourism here if tourists could be sure they wouldn’t have to fight undergrowth for much of the way! Fabulous views at the top (also at first light on the boat ride over from Tagulandang in the direction of Siau) but getting to the true summit cliffs on the far side looked pretty demanding, and none of my 4 (!) guides seemed keen on exploring it. A bit of smoke from the crater but not a huge amount of activity. 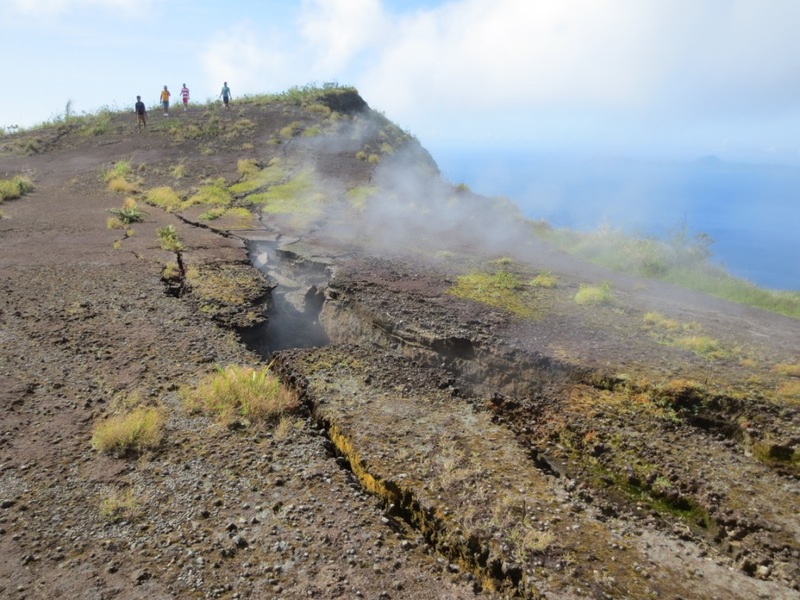 However, the eruption 15 years ago was serious enough for some previous residents to leave the island and never return. An easy trail to get lost on and one of the hottest (the small ones are the tough ones in the tropics) so remember a local guide, plenty of water, suncream, a hat etc. We ended up coming down to a slightly different starting point – probably a better one than the cement trail we followed initially at the back of the small school building. EIther way, take some locals with you as it is literally their ‘back yard’ so nobody knows it better and even if they got lost they will be able to get ‘un-lost’ again!